The Papermate Flair is a good porous-point pen; I’ve looked at both the black and red versions in the past. But they do come in a host of colors. I got the largest pack I could find, which seems to be exclusive to Sam’s Club, with 20 colors. And it’s so exclusive that I can’t find official color names for 4 of them. Those 4 will be in the last part of this series, the first 3 being Standard, Warm, then Cool. And now onto the colors. Black – The black is a fairly standard black (most are): it’s deep and cool. It’s office-appropriate and moderately smear-resistant. While it does smear, it is readable after most spills. Blue – A dark, office-type blue that is not a very natural color, but a pleasant one. It is legible and unintrusive. It lightens considerably and smudges when wet, but doesn’t erase. Red – A dull (but still punchy) red, nice to look at, but a bit pinkish. It’s less glaring and hard on the eyes for grading and warnings than comparable pen reds, but similar to most marker reds. Is fairly smear resistant, but does lighten. Green – A dark green, slightly darker than, say, a crayon green. It’s a deep, grassy, natural color. Noticeably different from the other, more common colors, but nothing that’ll jump out from across the room. It could be used in a liberal office. It smears and lightens quite a bit, though. Purple – One of the more usual, pops-off-the-page purples. It is noticeable as a purple and isn’t the most natural-looking color. It stands out from dark blues, but could get lost in a page of dark inks. Almost no smudging on this one, though it does feather a lot when wet. It could be used in a similar office to the green one. Yellow – A super-bright, stereotypical yellow. It’s almost illegible on white paper. It’s the most water-resistant after red and purple, but it all but disappears anyway. It hurts they eyes to look at for a long time (I’m not sure if it’s the brightness or the fact it’s hard to read) and isn’t a very natural-looking color. I wouldn’t recommend this one unless you’re coloring in books. 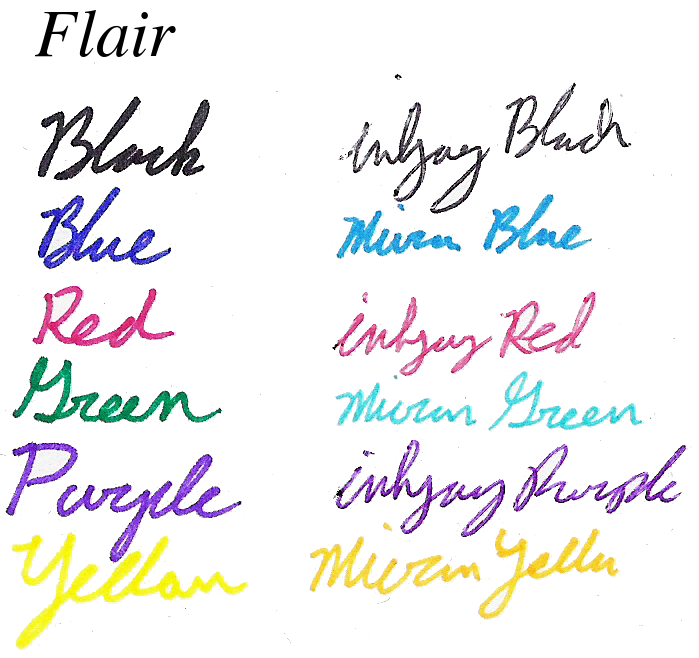 And that’s part 1 of my look at the 20 Papermate Flair colors. A good general assortment here, but nothing groundbreaking. Next week I’ll take a look at 5 of the more Warm colors in the set. This entry was posted in Intermediate Supplies, Utensils and tagged black, blue, felt tip, felt tip pen, flair, green, papermate, papermate flair, pen, pourus point pen, purple, red, review, standard, standard colors, yellow by Dragon Co (Austin Smith). Bookmark the permalink.